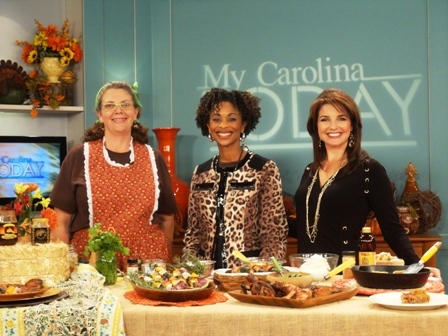 Valonda and Sharon invited me back again to their show, NBC17’s My Carolina Today Show, here in the Raleigh Triangle market… those two are so cute and fun I can never say no to their invites… although being a big girl as I am, I feel like Goliath Chef beside them. I’m sure they must wear something like Size -4 or something like that… and so bubbly I just wanna pinch their cheeks… bless their hearts! I usually take my clogs off during taping to help a little, but forgot when taping this week… the show will air tomorrow (Thursday, November 16th)… so as I post, I don’t have a link to the video yet they always throw up online… I’ll come back with that! My Southern Thanksgiving Table… with a twist! Gotta run… as Food Stylist and Recipe Developer for Our State Magazine, gotta be up realllllllllll early in the morning and in Greensboro BY 7:30…. 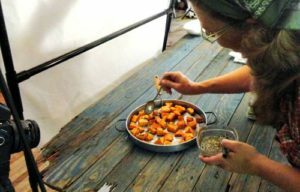 to shoot some wayyyy outside the box special recipes I developed for February issue… been working on them for a few months! Can’t tell ya any more than that… Top Secret, but you just run yourself on over and subscribe right now so it will come right to your mailbox in mid-January! (It’s a perfect gift that gives all year long too… for yourself or others.) You are just not gonna believe your eyes. Lordie Mercie, they are bringing in video folk too, to film the ‘behind the scenes’ of the assembly of these recipes and what goes on at a special photo shoot like this, so this gal needs all the ‘beauty rest’ she can get… but to tell you the truth, I’m SOOOO excited about this and feel like it’s my Christmas Eve and don’t anticipate much sleep, ‘tween that and the tornado watches going on thru the night. I’m about to bust wide open to tell folks about this… by my lips are sealed… for a few more weeks anyway. 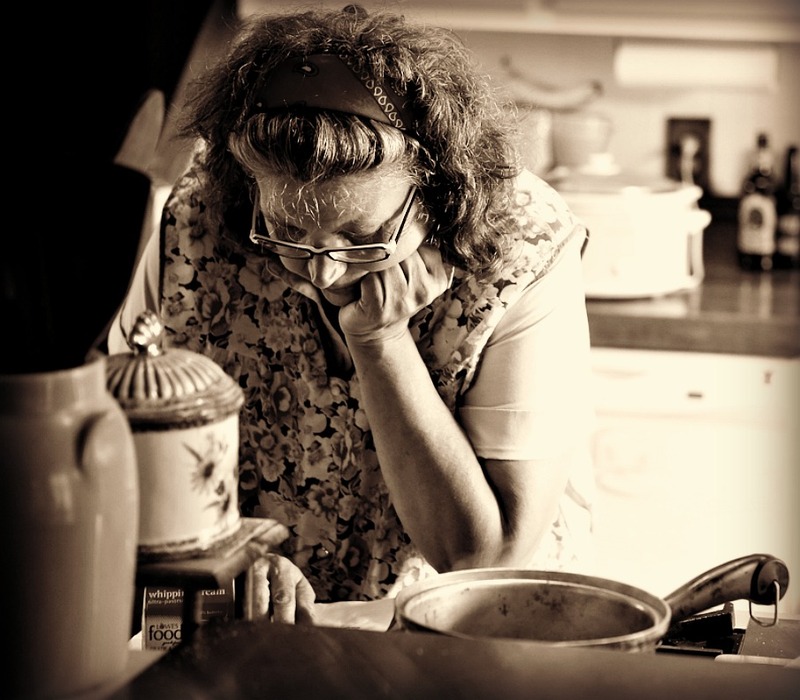 So… hope you enjoy these recipes… and Share Away! 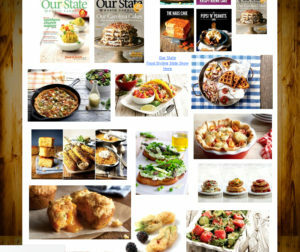 FOR 1 page PRINTABLE RECIPES, click HERE! Or, click the recipe name. We’re twist’n & kick’n up Thanksgiving this year with some new ways to cook and serve traditional oldies. 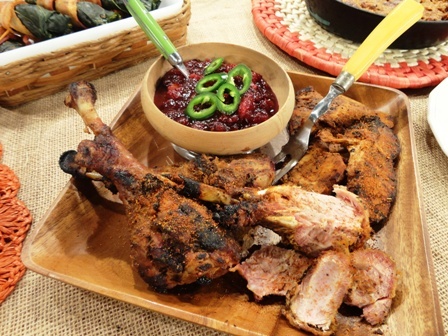 Everybody loves grilled goodies and this turkey is no exception. 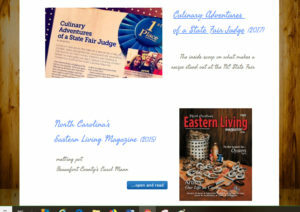 This recipe features some culinary goodies made here in North Carolina but you can sub your own favorites as well. Serving Size: however much you cook! TURKEY: To save time, you can buy cooked turkey breast. Shake (generously) some Tiny Town Turkey Rub onto turkey. 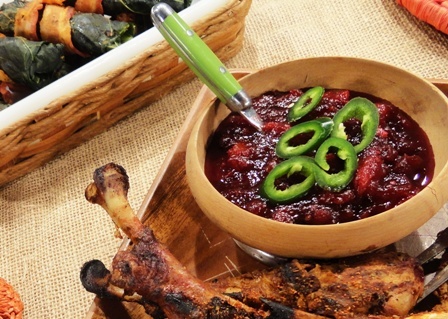 SAUCE: Mix BBQ sauce, mustard and jalapeno power in small bowl. Slice (cooked turkey) and place on grill. Baste with sauce and grill on each side until well-heated and sauce has caramelized a bit. times to allow sauce to glaze and caramelize. 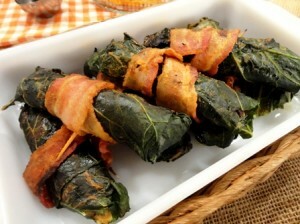 Use this to also to baste Bacon Wrapped Collard Rolls with Stuffing. Recipe Copyright© Wendy L. Perry, Inc.
You can throw this together in about 10 minutes with a bag of cranberries and some goodies you probably have on hand! Throw everything but cilantro and jalapeno into heavy saucepan. Bring to a boil and cook for about 8-10 minutes, until berries have popped and sauce has thickened. Pour into serving bowl and chill. At serving time, sprinkle with cilantro and jalapeno. Serve with BBQ Turkey and Bacon Wrapped Cabbage Rolls and Stuffing. This is also good on leftover turkey (and ham) sandwiches and wraps. 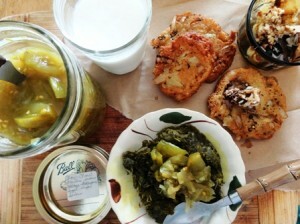 the quintessential southern green, and no traditional Thanksgiving table in these parts would be complete without ‘em. But this year, throw together some of these and throw on the grill along with your turkey for a real surprising twist… and your dressing, or stuffing, whichever you call it, is tucked inside! Like most of this meal, these can be made ahead and just throw on the grill when you cook your turkey. In deep skillet or pot, heat water 2 inches deep. 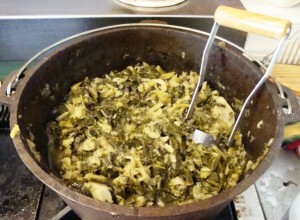 Once boiling, throw collard leaves into water (stacked on top of each other). Blanche several minutes until tender. Remove and drain in colander being careful not to tear leaves. Cook bacon in layers of paper towels in microwave (or skillet) several minutes until almost done, but still soft and pliable. 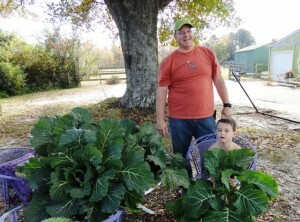 Lay collard leaf onto flat surface. 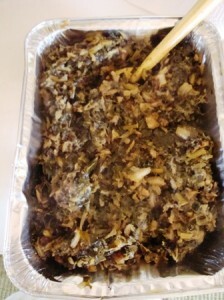 Spoon ½ cup of stuffing horizontally and roll up. Wrap a slice of bacon around the roll and secure with toothpick. Continue until all rolls are completed. Throw on hot grill and baste with the Turkey BBQ Sauce, turning to glaze while sauce lightly caramelizes and bacon finishes cooking. Serve with grilled turkey. 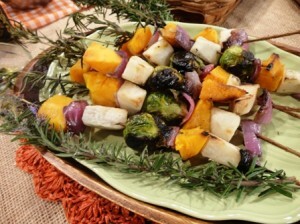 These are really easy to throw together for a new twist on traditional Thanksgiving vegetables. You can also make these ahead of time to throw on the grill with the rest of your Grilled Turkey Day meal. Strip leaves from rosemary stems, leaving about 2” of leaves on tip end. Set aside. Steam turnip and squash chunks in microwave until crisp tender being careful not to overcook; if too done, they will break apart when sliding onto skewers. Thread onto skewers… squash, turnip, onion, sprout, squash, turnip, onion (or whatever pattern you choose)… I use 1 Brussels Sprout in center but you can add more if you like. Throw onto grill making sure tips with leaves are over unheated area so they won’t burn off. Use sage stem with leaves to baste with melted butter while cooking. Grill, turning gently with tongs, until slightly charred on all sides. Sprinkle with salt and freshly ground pepper or seasoning of choice. 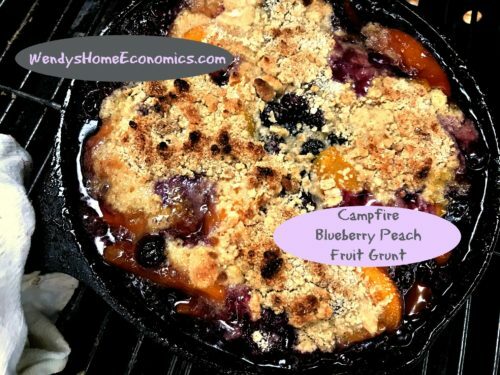 cooking and serving pie from a skillet just seems to make ‘em taste better! 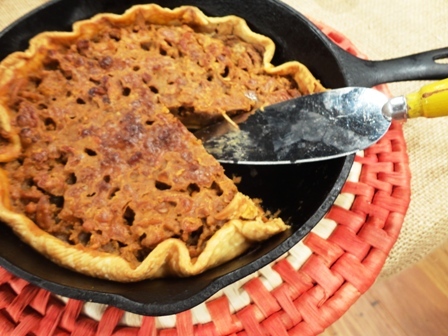 This pie just says ‘fall’… with the toasty pecans and richness of the butterscotch. Top with Sweet ‘Tater & Molasses Ice Cream and get ready for accolades all around for your DEElicious DEEssert. Spray 10″-12’ cast iron skillet; place crust into prepared pan. It will naturally ‘ruffle’ as shown in picture. In medium bowl, mix pecan pieces with flour. Add remaining ingredients and mix well. Pour into pie shell and bake 350* for about 40-45 minutes. Let pie cool before slicing as it is easier to cut at room temperature. 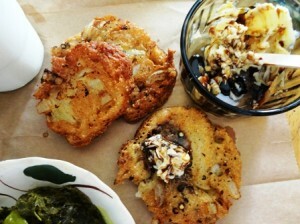 Serve with dollop of Sweet ‘Tater & Molasses Ice Cream and pinch of sea salt. You just don’t get much easier than this when it comes to Throw Cooking. This is a fun and easy recipe for little ones to throw together with you in the kitchen. 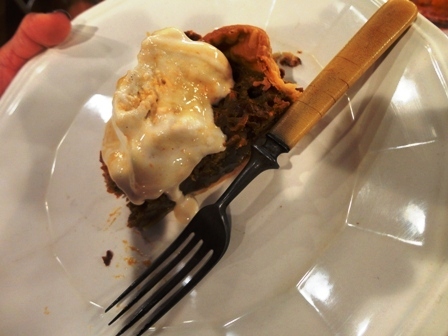 Eat as is, or plop some on top of a slice of BUTTERscoth PECAN Skillet Pie. Put softened ice cream into mixing bowl. Throw in sweet potatoes and spice. Drizzle with molasses and swirl into ice cream mixture. Refreeze. Serve as is or over pie with a pinch of sea salt on top! Sweet potatoes can be cooked in microwave on high power, about 10 minutes. Cook until soft when squeezed with a towel. Be sure they are well cooled before adding into ice cream. No matter how you serve them, you will get raves on this moist and tender Country-Style Steak Meatballs! Spoon over creamy grits or serve alongside mashed potatoes. Tuck inside slider buns or toasted sub rolls for the best sandwiches!